Check out our Ultrasound Optimization Guide to learn where to start as well as understand which buttons and knobs actually matter. 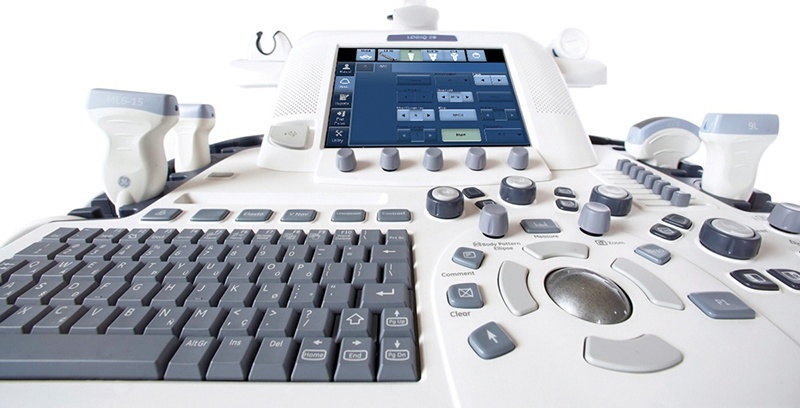 Did you recently purchase an ultrasound machine, unpack and set it up, then wondered “Where do I begin?” Physicians and clinicians, most never formally trained for ultrasound, are quickly finding out that using an ultrasound machine isn’t as easy as it was made look. All three questions will be answered later in this guide. First, let’s review the terminology relevant to understanding ultrasound knobology and image optimization. Keeping the above in mind, let’s answer our first question. Where should you begin? Begin by opening your systems user manual. Each user manual has a section in the front which outlines the location of different controls. Find that page and leave it open. If you don’t have a hard copy of the manual, you can search for one online to download to your computer. Have your computer near your ultrasound with the guide open to the page that outlines the different controls. Can't find one online? Most manufacturers store a PDF version on system. Press the F1, “?”, or help key on the keyboard to open it. You may want to take a picture of the console/control page with your smart device to use as a reference. With the user manual open to the system’s user console page, identify the below knobs/buttons. The gain dial will be one that you use frequently. Turning the gain dial will adjusts the overall brightness of the real-time (B-mode) ultrasound image. A simple twist can make a too dark image brighter allowing you to see subtle differences in texture. Some portable systems like those from SonoSite and use a simple near or far field adjustment. As the name implies, turning the near field gain dial will adjust the image gain in the top half of the image. Turning the far field gain dial will adjust the image gain in the bottom half of the image. Manufacturers like GE, Siemens, and Terason use up to 10 separate, depth specific, sliders to modify the image gain. TGC sliders are used to adjust the gain in specific areas of the image (near-, mid-, and far-field). Most sonographers adjust these to left-of-center for the near field (top), and slowly move to right-of-center as image quality decreases deeper in the image. The idea is to have lower gain in the near field and higher gain deeper in the image where image quality is weaker. The pulse of ultrasound can be manipulated to be at its narrowest at a particular depth, the focal position (red arrow on image). This means that image quality including lateral resolution is maximized at that level. The focal zone is typically positioned at or just below the object you are evaluating. More than one Focal zone can be selected however; this can significantly slow down the image frame rate. Adjusting the frequency allows you to improve the image resolution at the level of the object being evaluated. You should use the highest frequency available when scanning a superficial object (in the near field). You should use the lowest frequency available when scanning a deeper object (in the far field, deeper than 5-6 cm). Siemens, GE and others display the frequency range. The highest number is for near field scanning and the lowest number is use to penetrate for far field imaging. To capture the best image possible, adjust the frequency setting and use the highest possible frequency setting that allows you to see the anatomy you’re viewing. Most manufacturers offer a software feature that automatically optimizes the gain and overall contrast of the image. This feature analyzes the tissue in the image and attempts to provide you with the most optimized image. The image grey scale can be changed by adjusting the Grey Scale Map (Grey Map/Map). Most systems allow you to adjust the series of shades of white to black in the B-Mode image. This permits the brightness of the B-Mode dots to be displayed in various shades of gray to represent different echo amplitudes. This is one of the first changes to make with optimizing a custom preset. Adjusting gray maps on your image has a similar effect on an ultrasound image as changing the dynamic range, but they are different. The DR is the range of useful US signals expressed as the ratio between largest and smallest signals. Increasing the DR yields a higher number of gray scale levels (increased spatial resolution by increased contrast levels) and increased image detail and smoother images. Decreasing the dynamic range increases the contrast of the image, with more black and white areas than shades of gray. Set so that blood filled cavities appear dark. Dynamic Range adjusts the overall number of shades of gray. The gray map determines how dark or light you prefer to show each level of white/gray/black based upon the strength of the ultrasound signal. Adjusting the image persistence causes individual frames of the scan to linger, thus blending them with the images in the successive frames. This causes incremental degrees of smoothing to the ultrasound image. The depth buttons change the displayed image field in one centimeter gradation increments. Increasing the depth reduces the image resolution. At a higher depth, the transducer needs to cover a longer distance (remember to lower your frequency if needed), therefore the frame rate and the resolution are both lower. Note: The depth should set at the minimum required to visualize all structures of interest. We will start by creating a new patient exam. Press the patient button, enter a name, and ID if needed. Then select a linear transducer and the application/preset you want to use, and then click on the onscreen button that will start your exam (start, save, accept, activate). For this exercise, you will scan your left arm for a superficial venous exam. Note: The preset you select will be related to your clinical specialty however, there are several exceptions to this. Having started a new exam (entered a patient, selected a linear transducer and selected an applicable preset) you should be looking at an imaging screen. Did you select the Venous preset available with a linear transducer? That would have been a logical choice; however this setting has been standardized by manufacturers to visualize the structures of the Deep Venous System. Let’s fix that! Place some ultrasound transmission gel on the transducer, place the transducer on the medial side of your left arm and find the basilic vein. To complete the preset optimization, you will need to check the Color and PW Doppler settings. Now that you have the made the above changes, do you like the image? Most manufacturers, with the exception of SonoSite, allow you to save your changes as a custom preset. The steps to do this will be described in your user manual (saving a custom preset, quickset, etc). For Terason systems, press preset, look at your soft menu keys on the bottom left side of the monitor, click on save, type in a new name in the name text box of the pop up window and then click on save. For Esaote systems, press the probe button, click on preset manager, place the cursor in the text box next to “new”, type in a preset name and click on save. For most X series Siemens systems, press the quickset button on the keyboard, type a name into the quickset name text box, click on save. It’s best to go to your user manual to review the process because it is different on every machine. Most systems will not let you override the factory default settings but Esaote and Toshiba will. Keeping the factory default setting is the wise choice because it lets you start over if you “messed up”. With some practice, you’ll quickly become an expert on optimizing your ultrasound, saving a custom preset or making adjustments on-the-fly while acquiring an image.